Please note this is a Pre-sale item and is expected to ship on or around . Ordering Pre-Sale items may delay shipping your entire order. If you wish to order items and have them shipped seperately, please place a seperate order. 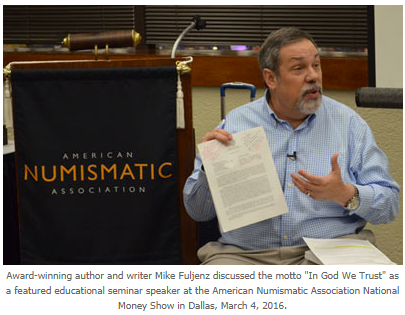 (Dallas, Texas) – Educator and acclaimed numismatic writer Dr. Michael Fuljenz gave an informative presentation on the national motto, “In God We Trust,” in Dallas, Texas on March 4, 2016. 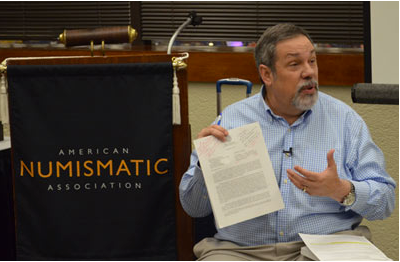 Fuljenz was a featured speaker on the topic, “The Untold Story of ‘In God We Trust’ and its Ties to the National Anthem” at the American Numismatic Association National Money Show. “Some critics of ‘In God We Trust’ may be ignorant of the phrase’s legal history or are deliberately ignoring the rulings of courts and resolutions of Congress,” explained Fuljenz of Beaumont, Texas who has written award-winning articles about the national motto (www.INGODWETRUSTonmoney.com). “It first appeared on circulating United States coins in 1864. 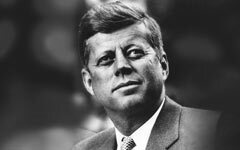 It has been on all our coins since 1938, became the only official national motto in 1956 with the signing of legislation by President Dwight Eisenhower, and has appeared on all our paper money since 1966,” said Fuljenz. In January 2016, a lawsuit was filed in Ohio seeking to remove the phrase from U.S. coins and paper money. In 2013, a Federal Court judge in New York dismissed a lawsuit seeking removal of In God We Trust from our currency. The judge noted that “the U.S. Supreme Court has repeatedly assumed the motto’s secular purpose and effect.” In 2011, the U.S. House of Representatives overwhelmingly approved a resolution reaffirming it as the national motto and encouraging its display in all public schools and government buildings. Fuljenz pointed out that while the motto first appeared on U.S. coins at the time of the Civil War, it actually was inspired by events a half century earlier during the War of 1812 when The Star Spangled Banner was composed. “In 1861, Treasury Secretary Salmon Chase received a letter from a Pennsylvania minister who requested ‘the recognition of the Almighty God in some form on our coins.’ Chase instructed Mint Director James Pollock to prepare a motto. Pollock recalled a lyric in the now-seldom sung fourth stanza of The Star Spangled Banner: ‘And this be our motto – In God is our trust.’ Pollock had the words, ‘GOD OUR TRUST,’ placed on a few experimental patterns being tested in the early 1860s for proposed new designs,” said Fuljenz. “After consultations and debate within the Treasury Department, the words, IN GOD WE TRUST, first appeared in circulation on a new coin denomination, copper two-cent pieces, starting in 1864,” said Fuljenz. A former high school chemistry and physics teacher and principal of the Governor’s gifted students program in Louisiana, Fuljenz has served on the Diocese of Beaumont Catholic School Board since 2007 and was President from 2010 to 2012. 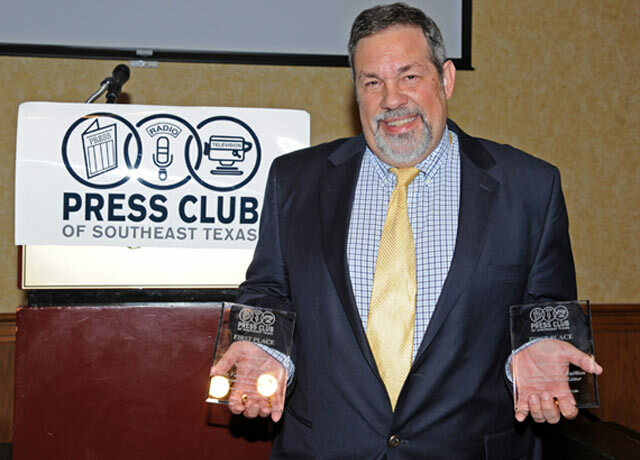 He was honored with the Catholic Charities of Southeast Texas Humanitarian Award in 2013. Known as America's Gold Expert®, Dr. Michael Fuljenz has won more than 50 prestigious national and regional awards and honors for his consumer education and protection work in rare coins and precious metals. 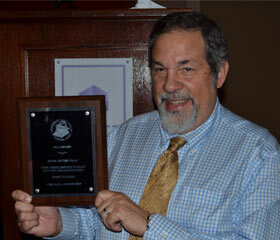 He recently received an Honorary Doctorate in Humane Letters from McNeese State University. 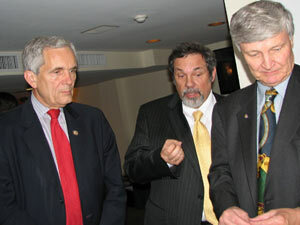 A respected community leader in his hometown of Beaumont, Texas, Mike also has served with distinction as a consultant to the Federal Trade Commission, United States Mint and Royal Canadian Mint, and is on the Board of Directors of the Jefferson County Texas Crime Stoppers organization, the Industry Council For Tangible Assets and the Numismatic Literary Guild. Dr. Mike Fuljenz Latest Gold Coins Book Wins NLG 2015 Book of the Year Award! For more than 25 years, First Fidelity Reserve has had the distinct pleasure of diligently providing superlative service, insightful analysis and comprehensive consultation to our national client base of rare coin investors and collectors. Our dedication and commitment to delivering prompt professional service on a daily basis and our flexibility to adapt in an ever-changing industry has and always will be a source of great organizational pride. "I contacted First Fidelity Reserve® on a silver/gold offer in a publication. My silver and gold coins were delivered promptly, well packaged, and in great shape. Even for introductory offers, First Fidelity Reserve® has top quality coins that were well packaged and always timely delivered." "I contacted First Fidelity Reserve® to place an order for the 2009 Silver American Eagle. First Fidelity Reserve's employees are informational and helpful. I like First Fidelity Reserve® because of the good values on their products." "I have been a First Fidelity Reserve® customer since 2009. I like First Fidelity Reserve® because they are overall very informative and have good prices." " I've seen my coins appreciate in value. I have recommended your company to my friends and family"
"I originally contacted First Fidelity Reserve® because of an ad I received regarding the purchase of Silver American Eagles. This was to be a one-time thing with no intent/need to acquire anything else from them. But, after talking with a knowledgeable staff member about my intended coin purchase, I realized this may be the start of a worthwhile relationship." Metals Market Report, new product updates and special offers. (1) All statements, opinions, pricing, and ideas herein are believed to be reliable, truthful and accurate to the best of First Fidelity Reserve's knowledge at this time. They are not guaranteed in any way by anybody and are subject to change over time. First Fidelity Reserve disclaims and is not liable for any claims or losses, which may be incurred by third parties while relying on information published herein. Individuals should not look at this publication as giving finance or investment advice or information for their individual suitability. (2) All readers of Coin Market Advisory are advised to independently verify all representations made herein or by its representatives for your individual suitability before making your investment or collecting decisions. (3) Coin collecting and investing are only meant for those who are personally and financially suited. First Fidelity Reserve does not recommend financing any purchase or spending more than you can afford to lose if your investment goes down in value. First Fidelity Reserve does not recommend customers pay a penalty for early withdrawal from any investment to purchase coins. Numismatic purchases are affected, in part, by economic and market conditions. While First Fidelity Reserve's competitive pricing, margins and market strategy approach the market with specific attention to the areas we recommend, we impress upon the customer to perform his or her own due diligence in deciding on the amount and type of their numismatic position and independently verify all representations. (4) As with all investments, the value of the coins could go up or down. First Fidelity Reserve and its representatives do not offer any implied or assumed promises. (5) First Fidelity Reserve considers coin collecting and investment to be a mid to long-term investment. As with all investments, past performance is not a guarantee of future returns. Further, you understand the coin market is speculative and unregulated and you could lose money if you have to sell these coins in the short run, say a year or two. 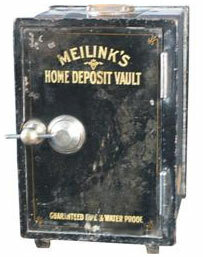 First Fidelity Reserve recommends a hold time of five to ten years or more. While offering no guarantee of growth in any time frame, First Fidelity Reserve wants the customer to understand that holding numismatic coins shorter than the recommended hold time could result in losses, while longer holding periods, such as 5-10 years or more increase the chances a coin's value can rise. First Fidelity Reserve strongly encourages you to view informational videos at FirstFidelityReserve.com including "Choosing the Right Dealer and Understanding Coin Pricing." (6) Our 100% Satisfaction Guarantee is: If you are not 100% satisfied with your purchase, you may return it in its original packaging within thirty (30) days of receipt for a full refund except on special orders or bullion orders. Specific exceptions to the thirty (30) day return privilege must be approved by management in writing. (7) Other returns of numismatic items outside the thirty (30) day return privilege may be subject to a restocking fee of up to 20% or repurchase at First Fidelity Reserve's buy price at the time of return. (8) Our policy is that payments for refunds on coins received and confirmed for liquidation will be processed in 10-15 business days unless specified otherwise by management in writing. (9) Although many areas of numismatics lend themselves to third party grading and authentication, third party certification does not eliminate all risks associated with the grading of coins. (10) Arbitration: First Fidelity Reserve strives to resolve customer complaint issues directly with customers in an expeditious manner. In the event an amicable resolution cannot be reached, you and First Fidelity Reserve agree to accept binding arbitration. Any controversy or claim arising out of or relating to transactions between you and First Fidelity Reserve shall be resolved by binding arbitration pursuant to the Federal Arbitration Act and administered by the American Arbitration Association in accordance with its Commercial Arbitration Rules in Jefferson County, Texas and judgment on the award rendered by the Arbitrator may be entered in any court having jurisdiction thereof. It is understood you and First Fidelity Reserve waive any right to a jury trial. YOU AND FIRST FIDELITY RESERVE agree THAT ALL CLAIMS SHALL be brought in the party's individual capacity and not as a class member in any purported class or representative proceeding. (11) In order to stay abreast of changing market conditions, YOU AUTHORIZE First Fidelity Reserve TO contact you from time to time by phone or TEXT regarding items of interest. (12) All phone conversations between you and First Fidelity Reserve are recorded. (13) All transactions and communication between First Fidelity Reserve, its employees, and you are only conducted through First Fidelity Reserve business address and business telephone numbers. (14) You understand it is your responsibility to contact the First Fidelity Reserve 100% Customer Service Standard Hotline between 8:30 A.M. & 5:00 P.M. CST Monday through Friday and speak with a manager regarding any issues or complaints that you may have. The toll free 100% Customer Service Standard Hotline is 877-877-2256. (15) Some experts recommend that in typical times, a diversified investor's portfolio contain a rare coin and precious metals component of 5% minimum to 25% maximum. Customers should not look at our written materials or our recommendations as giving personalized legal or investment advice. (16) You understand pricing of coins may vary based upon quantity and quality of coins purchased, type of coins purchased and other factors. You understand payment terms may vary based upon dollar amount of transaction, type of coin purchased, advertised offers and other factors. You understand all advertised offers are subject to inventory limitations of advertised product. You understand delivery time may vary based upon payment methods used. (17) Coin values are constantly changing and estimated verbal indications of value may vary due to multiple factors. The company cannot be responsible for any indications used for valuation and purchasing of customer coins unless its offer is in writing and confirmed according to the company's policies and procedures. (18) You understand and acknowledge all transactions between you and First Fidelity Reserve are processed in Jefferson County, Texas. (19) Reproduction or quotation of this newsletter is prohibited without written permission of First Fidelity Reserve. Coin Market Advisory is published by First Fidelity Reserve®, 130 Shakespeare, Beaumont, Texas 77706. (20) If any of the terms and conditions in this disclosure are unacceptable to you, please utilize our return Privilege. 1. By electing to utilize the services provided by First Fidelity Reserve (“First Fidelity”) including making purchases from First Fidelity or making sales to or trades with First Fidelity, you are agreeing to the following terms. These terms apply to all orders, all purchases, sales and trades made by telephone, through the website or otherwise. 2. Before you may place an order to purchase, sell or trade coins with First Fidelity through an online transaction, you must read and accept all of the terms included in this Agreement. If you have placed an order to purchase, sell or trade coins with First Fidelity via telephone and the terms of this Agreement are unacceptable to you, please utilize the return privilege referenced in Paragraph 4. Otherwise, you acknowledge acceptance of all terms of this Agreement. 3. You represent and warrant to First Fidelity that you have sufficient experience and knowledge to make informed decisions to purchase from and/or sell and/or trade coins to First Fidelity. You acknowledge you are making your own decision to purchase coins from First Fidelity or sell or trade coins to First Fidelity. You further acknowledge First Fidelity is not making any recommendations with respect to your online transactions. Additionally, you acknowledge all statements, opinions, and pricing relayed to you by First Fidelity representatives are believed to be reliable, truthful and accurate, but they are not guaranteed in any way and are subject to change without notice. You acknowledge that First Fidelity advises, and you have had the opportunity to perform your own due diligence in deciding the amount and type of your coin transaction and numismatic position. You understand and acknowledge that past performance is not a guarantee of future returns. You acknowledge that First Fidelity advises, and you have had the opportunity to independently verify all representations made via the First Fidelity website, via email, via First Fidelity publications or from First Fidelity representatives. You acknowledge First Fidelity is not liable for any claims or losses which might be incurred while relying on information published by First Fidelity. 4. You acknowledge that you are subject to a variety of risks which are beyond the control of First Fidelity, and you expressly acknowledge First Fidelity is not liable or responsible for those risks, which include, but are not limited to price volatility. You understand and acknowledge as with all investments, the value of coins could go up or down. You understand and acknowledge the coin market is speculative and unregulated and you could lose money if you sell your coins in the short term. You understand and acknowledge First Fidelity considers coin collecting and investment to be a mid to long term investment. You understand and acknowledge coin values are affected in part by economic and market conditions and you are willing to assume the risk associated with your coin transactions. You understand and acknowledge First Fidelity does not offer any express, assumed or implied promises regarding future performance, profit or growth of your coin purchase collection or investment. You understand and acknowledge First Fidelity recommends a hold time for coin purchases of five to ten years or more. You acknowledge First Fidelity does not guarantee a profit or growth in any time frame. You acknowledge and understand third party grading and authentication of numismatics does not eliminate all risks associated with the grading of coins. You understand if you are not 100% satisfied with your purchase, you may return it in its original packaging within thirty (30) days of receipt for a full refund except on special orders or bullion orders. You understand returns of numismatic items outside of the thirty (30) day return privilege may be subject to a restocking fee of up to 20% or repurchase at First Fidelity’s buy price at the time of return. You understand and accept First Fidelity’s policy that payments for refunds on coins received and confirmed for liquidation will be processed in 10-15 business days unless otherwise specified by management in writing. 5. You acknowledge and understand some experts in typical times recommend a diversified investor’s portfolio contain a rare coin and precious metals component of 5% minimum to a maximum of 25%. You shall independently determine what percentage is appropriate for you and your personal circumstances. 6. Although First Fidelity takes great care to provide accurate product and pricing information, pricing or typographical errors may occur. In the event an item is listed with incorrect information or an incorrect price due to an error in information or pricing, First Fidelity reserves the right at their sole discretion to refuse or cancel any order placed for that item. If an item is incorrectly priced, First Fidelity will contact you for instructions or cancel your order and notify you of such cancellation. Prices and availability of products are subject to change without notice. 8. You acknowledge that you are personally and financially suited for coin collecting and investing. You understand and acknowledge First Fidelity does not recommend financing any coin purchase or spending more than you can afford to lose if your investment declines in value. You expressly acknowledge any decision by you to finance coin purchases or spend more than you can afford to lose is solely your decision despite First Fidelity recommendations to the contrary. You acknowledge and agree that no warranties or guarantees have been made to you regarding the coins purchased from First Fidelity. 9. You acknowledge and understand First Fidelity does not recommend you pay a penalty for early withdrawal from any investment to purchase coins. You expressly acknowledge any decision by you to withdraw money from an investment and pay an early withdrawal penalty is solely your decision despite First Fidelity recommendations to the contrary. 10. You acknowledge and understand First Fidelity has the right to refuse an order when the confirmed price is incorrect, due to computer related problems, pricing error, incorrect item descriptions or sudden movements in the precious metal market. Furthermore, First Fidelity reserves the right to refuse or cancel any order deemed questionable, suspicious, or of significant risk to First Fidelity regardless of payment method and price confirmation. 11. You accept and acknowledge First Fidelity’s Terms and Conditions for customers and website visitors. 12. THE FORMATION OF THIS AGREEMENT CONSTITUTES THE MAKING OF THIS CONTRACT IN JEFFERSON COUNTY, TEXAS. REGARDLESS OF THE MANNER, TIMING OR LOCATION OF DELIVERY OR RECEIPT OF ACCEPTANCE OF THIS AGREEMENT, THIS AGREEMENT SHALL BE GOVERNED BY THE LAWS OF THE STATE OF TEXAS. SUBJECT TO THE ARBITRATION AGREEMENT IN PARAGRAPH 13, ANY LEGAL ACTION OR PROCEEDING BETWEEN YOU AND FIRST FIDELITY OR WITH RESPECT TO THIS AGREEMENT OR ANY TRANSACTION HEREUNDER SHALL BE BROUGHT EXCLUSIVELY IN THE COURTS OF THE STATE OF TEXAS LOCATED IN JEFFERSON COUNTY OR OF THE UNITED STATES OF AMERICA FOR THE EASTERN DISTRICT OF TEXAS. BY ACCEPTANCE OF THIS AGREEMENT, YOU AND FIRST FIDELITY HEREBY ACCEPT, GENERALLY AND UNCONDITIONALLY, THE JURISDICTION OF THESE COURTS. YOU AND FIRST FIDELITY WAIVE ANY OBJECTION, INCLUDING ANY OBJECTION TO THE VENUE OR BASED ON THE GROUNDS OF FORUM NON CONVENIENS, THAT YOU OR FIRST FIDELITY MAY NOW OR HEREAFTER HAVE TO ANY SUCH ACTION OR PROCEEDING IN SUCH JURISDICTIONS. 13. YOU AND FIRST FIDELITY AGREE TO ARBITRATE IN A FINAL BINDING MANNER PURSUANT TO THE FEDERAL ARBITRATION ACT AND ADMINISTERED BY THE AMERICAN ARBITRATION ASSOCIATION IN ACCORDANCE WITH ITS COMMERCIAL ARBITRATION RULES IN JEFFERSON COUNTY, TEXAS ALL CONTROVERSIES BETWEEN YOU AND FIRST FIDELITY, ITS OWNERS, REPRESENTATIVES OR AGENTS THAT CANNOT BE AMICABLY RESOLVED BY DIRECT NEGOTIATION OR THROUGH PRE-ARBITRATION MEDIATION, ARISING OUT OF OR RELATING IN ANY WAY TO ANY TRANSACTION WITH FIRST FIDELITY, YOUR ACCOUNT, OR ANY SERVICE PROVIDED BY FIRST FIDELITY TO YOU. JUDGMENT ON THE AWARD RENDERED BY THE ARBITRATOR MAY BE ENTERED IN ANY COURT HAVING JURISDICTION THEREOF. YOU AND FIRST FIDELITY UNDERSTAND THAT BOTH PARTIES WAIVE ANY RIGHT TO A JURY TRIAL. 14. IF ANY PARTY UNSUCCESSFULLY RESISTS ARBITRATION UNDER PARAGRAPH 13 OR THE CONFIRMATION OR ENFORCEMENT OF AN ARBITRATION AWARD RENDERED PURSUANT TO THIS AGREEMENT, THEN ALL COSTS, ATTORNEYS’ FEES AND EXPENSES INCURRED BY THE OTHER PARTY OR PARTIES IN COMPELLING ARBITRATION OR CONFIRMING OR ENTERING THE AWARD SHALL BE FULLY ASSESSED AGAINST AND PAID BY THE RESISTING PARTY. 15. YOU ACKNOWLEDGE AND AGREE THAT REGARDLESS OF ANY STATUTE OR LAW TO THE CONTRARY, ANY CLAIM OR CAUSE OF ACTION YOU MAY HAVE ARISING OUT OF, RELATING TO, OR CONNECTED TO COIN PURCHASES, COIN SALES OR ANY OTHER TRANSACTIONS BETWEEN YOU AND FIRST FIDELITY MUST BE FILED WITHIN ONE CALENDAR YEAR AFTER SUCH TRANSACTION OR FOREVER BE BARRED. NOTWITHSTANDING THE IMMEDIATELY PRECEDING SENTENCE, IF THE LAW OF THE APPLICABLE JURISDICTION HAS A “DISCOVERY RULE” WHEREBY ACCRUAL OF SUCH CLAIM IS DEFERRED WHICH IS APPLICABLE TO ONE OR MORE CLAIMS, THEN THE ONE YEAR LIMITATION PERIOD SPECIFIED HEREIN SHALL BEGIN RUNNING FROM THE DATE OF ACCRUAL FOR SUCH CLAIM OR CLAIMS AS DETERMINED BY THE LAW OF THE APPLICABLE JURISDICTION, IT SHALL REMAIN FULLY ENFORCEABLE AS TO ALL OTHER CLAIMS. 16. YOU ACKNOWLEDGE, UNDERSTAND AND ACCEPT THAT FIRST FIDELITY’S LIABILITY IN ALL CLAIMS WHETHER THEY SOUND IN TORT, CONTRACT, WARRANTY OR OTHERWISE, SHALL NOT EXCEED THE AMOUNT ACTUALLY PAID BY YOU FOR THE COINS IN DISPUTE LESS THE COINS’ FAIR MARKET VALUE AS OF THE DATE ANY ARBITRATION PROCEEDING IS COMMENCED. UNDER NO CIRCUMSTANCES SHALL First Fidelity BE LIABLE TO YOU FOR INDIRECT, INCIDENTIAL, ADDITIONAL, PUNITIVE, EXEMPLARY OR CONSEQUENTIAL DAMAGES. 17. YOU AND FIRST FIDELITY AGREE THAT ALL CLAIMS SHALL BE BROUGHT IN THE PARTY’S INDIVIDUAL CAPACITY AND NOT AS A CLASS MEMBER IN ANY PURPORTED CLASS OR REPRESENTATIVE PROCEEDING. 18. You acknowledge and confirm you are of legal age and capacity to enter into this Agreement. If you are acting in a capacity other than as an individual, you represent that you are fully authorized to act on the owner’s behalf. 19. You accept and acknowledge First Fidelity’s Disclosures which are included with each Invoice to you and appear on the website. 20. You understand, acknowledge and accept that there is a price differential or “spread” between First Fidelity’s selling price (the “ask price”) and First Fidelity’s buyback price (the “bid price”) for coins First Fidelity needs. First Fidelity’s “bid price” is the price it pays to customers for a coin. First Fidelity’s “ask price” is the price it charges customers for a coin. The spread is calculated by subtracting the bid price from the ask price and then dividing the difference by the ask price. ([Ask – Bid] ÷ Ask). You understand, acknowledge and accept First Fidelity’s current spread on common bullion coins typically ranges from 1% to 5%. First Fidelity’s current spread on the most common date antique coins typically ranges from 10% to 15%. First Fidelity’s current spread on the rarest coins typically ranges from 33% to 38%. 21. You understand and agree that First Fidelity may, in First Fidelity’s discretion, but is not obligated to do so, monitor or record your telephone conversations with First Fidelity for quality control and First Fidelity’s protection. 22. You understand First Fidelity employees may from time to time discuss the general direction of various financial markets, but neither First Fidelity nor its representatives can guarantee or predict any market movement. 23. You understand First Fidelity does not offer advice on the tax treatment of purchasing, selling or trading bullion or rare coins. You understand you must consult with your tax advisor regarding such matters. 24. When you provide a check as payment, you authorize us to either use information from your check to make a one-time electronic fund transfer from your account or to process the payment as a check transaction. When we use information from your check to make an electronic fund transfer, funds may be withdrawn from your account as soon as the same day you make your payment, and you will not receive your check back from your financial institution. 25. You authorize representatives from First Fidelity to contact you via phone, text or email to discuss items of interest. 26. Market Loss Policy. When you make a bullion purchase through our online store, you have entered into a binding contract for the purchase at the agreed upon price. If you choose to cancel the transaction or default on payment or if you default on any other act required of you, you agree that you have full responsibility to First Fidelity for any Market Loss plus a $30 cancellation fee. You will also be fully responsible and liable to First Fidelity for any and all fees or costs associated with collecting from you. Any market gain shall belong to the company. All pending or future orders shall be held for shipment until all cancellation fees and Market Loss amounts are fully paid. 28. When you choose to pay for an online purchase by using a personal check, we require a credit card on file to enforce our Market Loss Policy, cancellation fee and to verify your identity. 29. Bullion and Special Order Cancellation Policy. 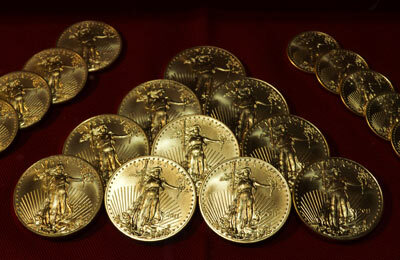 The 30 day refund policy does not apply to bullion or special orders. On bullion or special orders, all prices are locked in at the time of purchase on the online store and upon receipt of good funds for phone orders. If you choose to cancel a purchase of bullion or special order products, you must do so by contacting us via phone at (800) 336-1630 during regular business hours. Cancellation of an order cannot be accomplished without speaking to a manager. You may not cancel an order by leaving a message with the answering service or voicemail. All cancelled bullion or special order transactions are subject to our Market Loss Policy plus a $30 cancellation fee. When you speak to the manager regarding the cancellation, any market loss will be calculated and added to the $30 cancellation fee. The cancellation fee and any market loss will be charged to your credit card. Any market gain on cancelled orders shall belong to the company. 30. When you choose to pay for an online purchase by using wire transfer, we require a credit card on file to enforce our Market Loss Policy, cancellation fee and to verify your identity. 31. Force Majeure. If First Fidelity is unable to perform any obligation hereunder as a result of any event beyond its control, First Fidelity’s delay or failure to perform such obligation shall be excused and First Fidelity shall not be liable for any damages as a result of such delay or failure to perform. 32. You shall hold the existence and terms of all your transactions with First Fidelity, including, without limitation, the existence of any disagreement or dispute and the existence and terms of any resolution thereof in the strictest confidence and you shall not disclose or publish on the internet or elsewhere, any such information to any person or entity without written consent of First Fidelity, or an order by a court of competent jurisdiction. If you become aware you may be required to make a disclosure, you shall promptly notify First Fidelity in writing and shall cooperate in good faith with First Fidelity in obtaining a protective order or other appropriate relief, if any, with respect to such disclosure. 33. Severability. This Coin Transaction and Website User Agreement is intended to be enforceable to the fullest extent permitted by applicable law. If any term of this Agreement is held to be unenforceable for any reason, such unenforceability shall not affect the other terms of this Agreement. 34. Amendment. First Fidelity may amend this Agreement at any time by posting the amended terms on the website. Except as otherwise provided in this Agreement, the amended terms will become automatically effective thirty (30) days after their initial posting on the website. You acknowledge and agree that it is your responsibility to review the Website and this Coin Transaction and Website User Agreement periodically, and to be aware of any modifications. Your continued use of this Website and/or your continued use of any services provided by First Fidelity after such modifications will constitute your acknowledgement of the Modified Coin Transaction and Website User Agreement and your agreement to abide and be bound by the Modified Coin Transaction and Website User Agreement. This Agreement may not be otherwise amended except by written agreement between First Fidelity and you. Thank you for accessing our website ("Site") operated by First Fidelity Reserve, Ltd. ("FFR"). We respect your privacy and want to protect your personal information. By visiting the Site directly or through another site, you accept the practices described in this Policy. As we update and expand our Site and services, this Policy will be amended to protect your privacy. Please check the Site periodically for updates and feel free to contact us at any time with questions or suggestions regarding this Policy. If you have questions or concerns regarding this Policy, please contact us by email at info@FirstfidelityReserve.com or writing to the following address: First Fidelity Reserve, 130 Shakespeare, Beaumont, Texas 77706. When corresponding with us please reference your customer number. We collect information from you in multiple ways on this Site. The primary objective in collecting personal information from you is to provide you the best possible customer experience. For example, we can use your personal information to help us create content that is most relevant to you or alert you to new information, products, and services that we offer. Email Addresses. You may be required to provide your email address for purposes including but not limited to: registering for information or to access certain information, sign up for email news alerts and special offers; or to order a product online. Registration on our Site. If you choose to purchase a product online, we will ask for your name, telephone number, billing address and credit card number and related information. This personal information is necessary for billing purposes, to fulfill your orders, to communicate with you about your order and the Sites, and for internal marketing purposes. If a problem arises while processing your order, your personal information may be used to contact you. We may also use your personal information to verify the delivery or credit card information or otherwise conduct due diligence to ensure proper processing of your order and to minimize the risk of fraudulent transactions. We may verify your personal information including addresses or telephone numbers using third party providers. Social Security Numbers. We only collect Social Security Numbers when it is legally required to perform a service such as providing goods related to a self-directed IRA or as required by applicable law. Cookies and Other Technology. The Site, like most websites, employs cookies to assist your navigation of the Site, recognize you and your access privileges, and track your Site usage. We will use your personal information to communicate with you about your orders, requests for information and deliveries. Also, we may send you a confirmation email when you register or order with us. You may submit your email address for reasons such as sign up for email news alerts and special offers or to request free information about acquiring our products. If you submit your email address, we use it to deliver the information to you. We always permit you to unsubscribe or opt out of future emails (see the opt out section below for more details). Because we have to communicate with you about orders that you choose to place, you cannot opt out of receiving emails related to your orders. We use your personal information to process your order, provide requested information and provide you with customer service. We may internally use your personal information to improve the Sites’ content and layout, to improve outreach and for our own marketing efforts (including marketing our services and products to you), and to determine general marketplace information about visitors to the Site. Information provided to shipping entities to ensure delivery of your orders. Additionally we must provide your credit card number to financial-services corporations such as credit card processors. The security and confidentiality of your information is important to us. We have implemented certain technical, administrative, and physical security measures designed to help protect customer information from unauthorized access and improper use. This is an ongoing process and, from time to time, we review our security procedures in order to consider appropriate new technology and methods. Please be aware that despite a company’s best efforts, no security measures are perfect or impenetrable. We are committed to providing you a safe, risk free environment. We use some of the most sophisticated security software available on the market and have done everything reasonably possible to ensure that any personal information you share with us will not be misappropriated. Should you ever suspect an unauthorized party has obtained or used your personal information, please contact us immediately. We will investigate the matter thoroughly. Any time that you discover or suspect fraud, you should contact your credit card company immediately. The Site incorporates physical, electronic, and administrative procedures to safeguard the confidentiality of your personal information, including Secure Sockets Layer (“SSL”) for all financial transactions through the Site. We use SSL encryption to protect your personal information online, and we also take several steps to protect your personal information in our facilities. Personal information may be printed or otherwise stored in a non-electronic form. Employees who need access to your personal information to perform a specific job are permitted access to your personal information. Finally, we may rely on third-party service providers for the physical security of some of our computer hardware. We believe that their security procedures are adequate. For example, when you visit the Site, you access servers that are kept in a secure physical environment, behind a locked cage and an electronic firewall. Our site is not directed to individuals under the age of eighteen (18) and we request that these individuals do not provide personal information through our site. We do not knowingly collect information from children under thirteen (13) without parental consent. FFR does not guarantee complete security either online or offline. Upon your request, we will (a) correct or update your personal information; and/or (b) stop sending emails to your email address. You can make these requests at the customer information section of the Site or by calling FFR at (800) 336-1630 or emailing your request to info@firstfidelityreserve.com. You understand and agree that FFR may, at FFR’s discretion, but is not obligated to do so, monitor or record your telephone conversations with FFR for quality control and for FFR’s protection. Unless otherwise agreed by FFR in writing, FFR does not consent to the recording of telephone conversations by you or any third party. You understand that not all telephone lines or calls are recorded and FFR does not guarantee that any recordings of any particular telephone calls will be retained or be capable of being retrieved. If you have any comments or questions about our security and privacy statement, please call us at (877) 877-2256 or email our Customer Service Department at info@firstfidelityreserve.com. You understand if you are not 100% satisfied with your purchase, you may return it in its original packaging within thirty (30) days of receipt for a full refund except on special orders or bullion orders. You understand returns of numismatic items outside of the thirty (30) day return privilege may be subject to a restocking fee of up to 20% or repurchase at First Fidelity Reserve's buy price at the time of return. You understand and accept First Fidelity Reserve's policy that payments for refunds on coins received and confirmed for liquidation will typically be processed in 10-15 business days unless otherwise specified by management in writing. AS USED IN THESE TERMS AND CONDITIONS, THE TERM "YOU" SHALL MEAN ANY VISITOR TO THE SITE AND/OR CUSTOMER OF FIRST FIDELITY RESERVE. PLEASE READ THESE TERMS AND CONDITIONS CAREFULLY. BY ACCESSING THIS SITE YOU AGREE TO BE BOUND BY THE TERMS AND CONDITIONS BELOW. THESE TERMS AND CONDITIONS ARE SUBJECT TO CHANGE WITHOUT NOTICE. WE WILL NOTIFY YOU OF AMENDMENTS TO THESE TERMS AND CONDITIONS BY POSTING THEM TO THIS SITE. IF YOU DO NOT AGREE WITH THESE TERMS AND CONDITIONS, PLEASE DO NOT ACCESS THIS SITE. First Fidelity Reserve ("FFR") operates this Website (the "Site") to provide online access to information about FFR and its products. By accessing and using this Site, you agree to each of the terms and conditions set forth herein ("Terms and Conditions"). Additional terms and conditions applicable to specific areas of this Site or to particular content or transactions are also posted in particular areas of the Site and, together with these Terms and Conditions, govern your use of those areas, content or transactions. These Terms and Conditions, together with applicable additional terms and conditions, are referred to as this "Agreement". FFR reserves the right to modify this Agreement at any time without giving you prior notice. Your use of the Site following any such modification constitutes your agreement to follow and be bound by the Agreement as modified. The last date these Terms and Conditions were revised is set forth at the bottom of this page. You may use this Site, and the information, writings and images on the Site solely for your non-commercial, personal purposes and/or to learn about FFR products. No right, title or interest in any content is transferred to you, whether as a result of downloading such content or otherwise. FFR reserves complete title and full intellectual property rights in all content. Except as expressly authorized by this Agreement, you may not use, alter, copy, distribute, transmit, or derive another work from any content obtained from the Site except as expressly permitted by these Terms and Conditions. The Site and the content are protected by U.S. copyright laws, and belong to FFR, its licensors, contributors or third parties. The copyrights in the content are owned by FFR or other copyright owners who have authorized their use on the Site. Links on the Site to third party websites or information are provided solely as a convenience to you. If you use these links, you will leave the Site. Such links do not constitute or imply an endorsement, sponsorship, or recommendation by FFR of the third party, the third-party Site, or the information contained therein. FFR is not responsible for the availability of any such Site. FFR is not responsible or liable for any such Site or the content thereon. Prior to linking to this site, you must first obtain FFR’s written permission. Requests to link to the Site should be sent to info@FirstfidelityReserve.com. Unless specifically authorized by FFR, you may not connect "deep links" to the Site, i.e., create links to this Site that bypass the home page or other parts of the Site. You may not mirror or frame the home page or any other pages of this Site on any other Site or web page. FFR cannot and does not guarantee or warrant that files available for downloading through the Site will be free of infection by software viruses or other harmful computer code, files or programs. FFR MAKES NO EXPRESS OR IMPLIED WARRANTIES, REPRESENTATIONS OR ENDORSEMENTS WHATSOEVER WITH RESPECT TO THE SITE OR THE CONTENT. FFR EXPRESSLY DISCLAIMS ALL WARRANTIES OF ANY KIND, EXPRESS, IMPLIED, STATUTORY OR OTHERWISE, INCLUDING, BUT NOT LIMITED TO, IMPLIED WARRANTIES OF MERCHANTABILITY, FITNESS FOR A PARTICULAR PURPOSE, TITLE AND NON-INFRINGEMENT, WITH REGARD TO THE SITE, THE CONTENT, AND ANY PRODUCT FURNISHED OR TO BE FURNISHED VIA THE SITE OR BY FFR TO YOU AFTER YOU HAVE VIEWED THE SITE. FFR DOES NOT WARRANT THAT THE FUNCTIONS PERFORMED BY THE SITE WILL BE UNINTERRUPTED, TIMELY, SECURE OR ERROR-FREE, OR THAT DEFECTS IN THE SITE WILL BE CORRECTED. FFR DOES NOT WARRANT THE ACCURACY OR COMPLETENESS OF THE CONTENT, OR THAT ANY ERRORS IN THE CONTENT WILL BE CORRECTED. THE SITE AND THE CONTENT ARE PROVIDED ON AN "AS IS" AND "AS AVAILABLE" BASIS. You understand and agree that you are personally responsible for your behavior on this Site. You agree to indemnify, defend and hold harmless FFR, its parent companies, subsidiaries, affiliated companies, joint venturers, business partners, licensors, employees, agents, and any third-party information providers to the service from and against all claims, losses, expenses, damages and costs (including, but not limited to, direct, incidental, consequential, exemplary and indirect damages), and reasonable attorneys' fees, resulting from or arising out of your use, misuse, or inability to use the Site, the service, or the content, or any violation by you of this Agreement. You agree to use the Site only for lawful purposes. You agree not to take any action that might compromise the security of the Site, render the Site inaccessible to others or otherwise cause damage to the Site or the content. You agree not to add to, subtract from, or otherwise modify the content, or to attempt to access any content that is not intended for you. You agree not to use the Site in any manner that might interfere with the rights of third parties. You agree that you will not use any robot, spider, other automatic device, or manual process to monitor or copy our Web pages or the content contained herein without our prior expressed written permission. You agree that you will not use any device, software or routine to interfere or attempt to interfere with the proper working of the Site or any transaction being conducted on our Site. You agree to abide by all applicable local, state, national, and international laws and regulations in your use of the Site. Our Site is available only to individuals who are permitted to use it under applicable law. If you do not qualify, please do not use our Site. You agree to be solely responsible for your actions and the contents of your transmissions through the Site. You agree not to impersonate any person or entity or falsely state or otherwise misrepresent your identity or affiliation with a person or entity. By accessing this Site you accept and acknowledge the Coin Transaction and Site User Agreement. The Site may contain technical inaccuracies or typographical errors or omissions. We are not responsible for typographical, pricing, product information, advertising or other errors on the Site. Advertised prices and available quantities are subject to change without notice. We reserve the right to make changes, corrections and/or improvements to the products and programs described on the Site at any time without notice. We are not responsible for communication malfunctions, failures, or difficulties, or lost, stolen, or misdirected, transmissions, messages or entries, or the security of any such communications. Further, we are not responsible for incorrect or inaccurate entry information, whether caused by user(s) or by any of the equipment or programming associated with the Site, or by any technical or human error that may occur in the processing of any information related to the Site. We are not responsible for any damages that may arise as a result of any orders you request or make on this Site which are not processed or accepted for any reason. The Site and content are not intended to and do not constitute financial, legal or tax advice. Please seek the advice of professionals as necessary regarding the evaluation of any content on this Site. You should consult with your appropriate legal, financial or tax advisor regarding issues arising from the acquisition or disposition of precious metals, rare coins, rare currency and any financial investment. The information on this Site is not intended as an offer or solicitation for the purchase of any stock, any other security or any financial instrument or to provide any investment service or investment advice in any jurisdiction. You acknowledge that FFR advises and you have the opportunity to perform your own due diligence in deciding the amount and type of your coin transaction and numismatic position. You acknowledge that FFR advises and you have the opportunity to independently verify all representations made via the FFR website, via email, via FFR publications or from FFR representatives. All materials that are contained on the Site were, to the best of our knowledge, timely and accurate when first presented. However, the passage of time can render information stale, and you should not rely on the continued accuracy of any such material beyond the date of issuance. We have no responsibility to update any information contained in any such material. All viewers should carefully check the dates of issuance of the material contained in the Site. YOU AND FFR AGREE TO ARBITRATE IN A FINAL BINDNG MANNER PURSUANT TO THE FEDERAL ARBITRATION ACT AND ADMINISTERED BY THE AMERICAN ARBITRATION ASSOCIATION IN ACCORDANCE WITH ITS COMMERCIAL ARBITRATION RULES IN JEFFERSON COUNTY, TEXAS ALL CONTROVERSIES BETWEEN YOU AND FFR, IT’S OWNERS, REPRESENTATIVES OR AGENTS THAT CANNOT BE AMICABLY RESOLVED BY DIRECT NEGOTIATION OR THROUGH PRE-ARBITRATION MEDIATION ARISING OUT OF OR RELATING IN ANY WAY TO THESE TERMS AND CONDITIONS OR ANY TRANSACTION WITH FFR, YOUR ACCOUNT, OR ANY SERVICE PROVIDED BY FFR TO YOU. IT IS UNDERSTOOD THAT YOU AND FFR WAIVE ANY RIGHT TO A JURY TRIAL. YOU AND FFR AGREE that all claims shall be brought in your or FFR’s individual capacity and not as a class member in any purported class or representative proceeding. You acknowledge and agree that, regardless of any statute or law to the contrary, any claim or cause of action you may have arising out of, relating to, or connected with your use of the Site, coin purchase, coin sales or any other transactions between you and FFR must be filed within one calendar year after such claim or cause of action arises, or forever be barred. We will have the right to terminate your access to the Site if we reasonably believe you have breached any of these Terms and Conditions. Following termination, you will not be permitted to use the Site and we may, in our discretion, cancel any outstanding product orders. If your access to the Site is terminated, we reserve the right to exercise whatever means we deem necessary to prevent unauthorized access to the Site, including, but not limited to, technological barriers, IP mapping, and direct contact with your Internet Service Provider. These Terms and Conditions will survive indefinitely unless and until we choose to terminate it, regardless of whether any account you open is terminated by you or us or if you have the right to access or use the Site. Entire Agreement/No Waiver. These Terms and Conditions constitute the entire agreement of the parties with respect to the subject matter hereof. No waiver by FFR of any breach or default hereunder shall be deemed to be a waiver of any preceding or subsequent breach or default. Correction of Errors and Inaccuracies. The content may contain typographical errors or other errors or inaccuracies and may not be complete or current. FFR therefore reserves the right to correct any errors, inaccuracies or omissions and to change or update the content at any time without prior notice. FFR does not, however, guarantee that any errors, inaccuracies or omissions will be corrected. Claims of Copyright Infringement. Pursuant to Title 17, United States Code, Section 512(c)(2), notifications of claimed copyright infringement should be sent to Service Provider's Designated Agent.